This year was certainly better than last year when it came to the diversity of quality films. 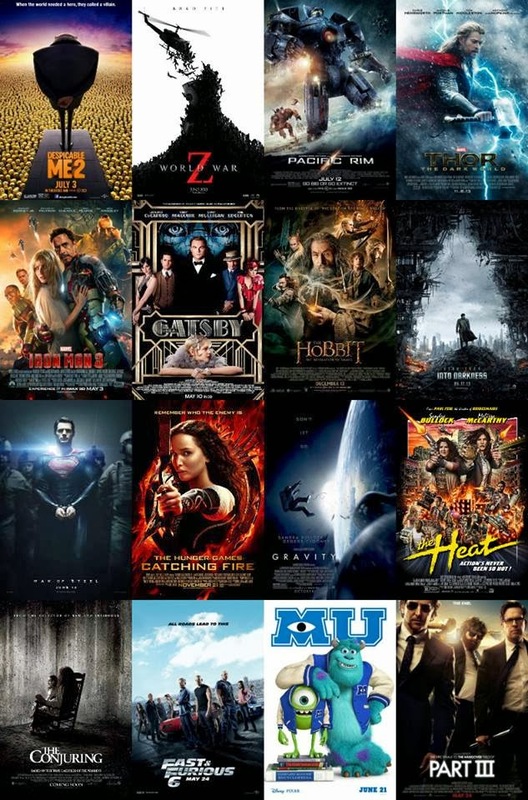 I still worry that I see too many sequels and comic book based movies but I have to say there were several that I enjoyed quite a bit. When I get to the traditional top ten list later, I was surprised to see that there were no animated films near the top. Last year I had two and in 2010 I had three. Monsters University was as close as I could come and it was not that close. Also missing from my list will be a few surprises. I love Star Trek, but “Into Darkness” just missed the list. “Man of Steel” was one of my most highly anticipated films of 2013, and the more I think about it, the lower it drops in my esteem. “The Wolf of Wall Street” was not just a disappointment to me, it kinda ticked me off. Before I pass out my accolades to the movies of the last year, I want to comment a bit on my own blogging efforts. I try to look at a variety of blog pages from people that I have encountered on line. 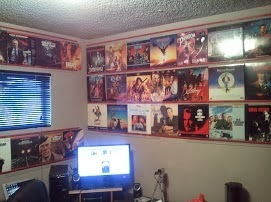 I visit Keith and the Movies, The Cinematic Katzenjammer, It Rains…You Get Wet, and Every 70s Movie on a daily basis. Several other bloggers also are worth visiting, I just don’ always have time every day, they include Morgan on Media, Citizen Charlie, And So It Begins, and Scopophilia Movies of the 60s, 70s,80s. Two of my favorite blogs however are not daily blogs, My Movies My Words is a project by a writer on the other side of the country and I enjoy Eric’s take on films but he posts when he can rather than on a regular schedule. Finally, Fogs Movie Reviews has discontinued publishing but Dan still has two years worth of posts that you can go back though and enjoy. Many of these sites are more prolific than I could ever hope to be and some of the writers have a way with words and insights that frankly intimidate me a bit. I am however happy with what I manage to produce and by way of narcissistic-ally looking back over the year I producede this inventory. I did some kind of post on all 89 trips to a movie theater that I made this year. That was a lot of AMC Stubbs reward points but also a lot of money spent. 11 Classics seen on the big screen years after their first appearance in theaters. 41 Posts that are not strictly reviews this includes blogathon reviews, MIWETS on Fogs and My page, and assorted commentaries on movie related issues. 341 Different films watched during the year. At least forty of those were watched a second time so I definately averaged more than a movie a day, even if I did not post on all of them. Ten Favorite Moments from 2012 A countdown of favorite moments from films in 2012, most of these moments lasted thirty seconds or less. It was fun to put together but the video quote from Piranha 3DD is missing because the film was taken down (Probably by my own daughters company). Kirkham A Movie A Year A quick visual trip though my 55 years on the planet. King Kong Times 3 A personal reflection on the three versions of the story of the Eighth Wonder of the World. Three Perfect Movies Do yourself a favor and watch any of these gems that not everyone is aware of. If I ever need to cheer myself up, I put in one of these 3 movies and I am happy again almost immediately. The Adventures of Robin Hood on the 75th Anniversary of its release. This is the original post and it still has the video links that were not copied to the Favorite film page. 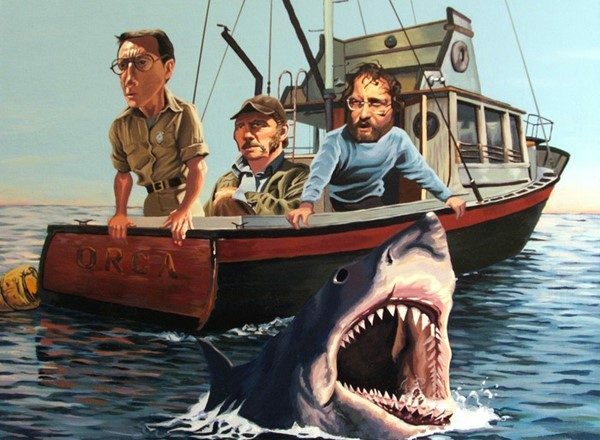 Jaws: The Vlog Link This link will take you to an epic forty-five minute video on the movie. I yak for about twenty minutes, There is a quick interview with some guys at the theater in costume and then Amanda and I debrief for about twenty minutes. A big investment of your time, but I had a blast doing it. 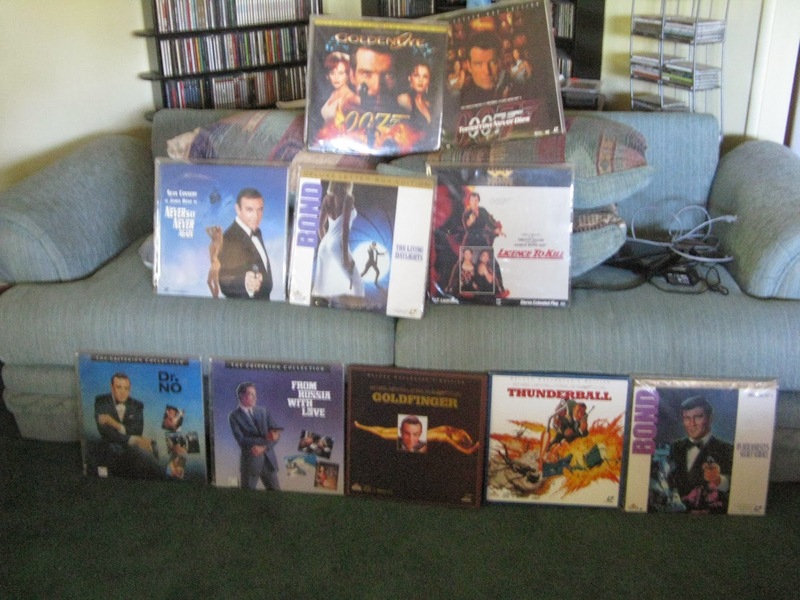 Top Ten 007 Movie Posters I was inspired by Eric from “My Movies, My Words” and then was re-blogged by Michael at “It Rains …You Get Wet.” Another chance to talk about one of my favorite subjects, Bond, James Bond. Drew: The Man Behind the Poster This may have been the film going highlight of the year. I got to meet the subject of the film and have a short conversation with both he and the director. Look for the movie either on DVD or Streaming, a fascinating look at a real artistic genius. CK Secret Santa Blog a Thon My secret Santa gave me a terrific classic to post on. If you go to the link there is also a link to the Cinematic Katzenjammer site that compiles all the secret Santa Reviews. Movies I Want Everyone to See I was privileged to write for Fogs Movie Reviews for almost five months. This is the review I did for my wife’s favorite movie and one of the things I’m most proud of writing for that now closed site. Next Up, the Traditional Top Ten List. Check back soon, it should be up sometime on January 1, 2014. This movie has apparently been sitting on a shelf for a year or so, and there were not a lot of ads or promotions for it. I guess the studio decided that their investment could not be recovered and they are protecting themselves by releasing it as counter-programing during the holidays and offering only a small amount of release support. That’s a business decision, and the investors have to go with their guts. I think the movie may have been tainted by some of those actions because it was much better than I was expecting it to be. A little palate cleansing is nice at this time of year. I just saw six new releases of end of the year Oscar bait and Holiday cash in fare. I’ve been a little overwhelmed and I looked forward to something fairly mindless and action oriented, and here sat “47 Ronin” starring Keanu Reeves on my doorstep. The trailer was not promising, it emphasizes the CGI 3-D hooks of the movie. Fortunately, there is less of that element than might be expected. There are still dragons and ogres and mystical warriors, but the vast majority of the plot seems to be standard samurai action and setting. Mr. Reeves is often criticized for his acting skills but I have found him acceptable most of the time if he is cast well. There are not long passages of dialogue for him to spout. The exposition is done in an opening narration and through the voices of other characters. There was only one sequence where Keanu delivers lines that are portentous and even in that spot the sentences are short and to the point. If your objection is to Keanu in a love story set in the Samurai world, don’t worry, that is only a small element of what takes place. In truth his character Kai is more of a co-starring role rather than lead. He is an important character, but the story is not about his journey, he is simply one of those acting to avenge their master and restore balance to the world as they see it. The events are steeped in mysticism but are based on a real event that has been retold and embellished and changed over the years. The actions of the warriors appear to be in keeping with the code that they lived by and this movie takes pains to emphasize that. There are frequent ceremonial rituals that are engaged in, and clothes that are associated with families and levels of service. The obligations that the ronin feel are explained by their leader and illustrated by their actions. This was one of the aspects of the movie that made it so much more appealing to me. There are several action scenes and the magical/supernatural elements do appeal to a broader audience in modern cinema, but I think this could have been effectively told without all of those components. A couple of examples of elements that feel overdone; when the lead retainer, Ôishi seeks the banished Kai, he ends up in the set from the third “Pirates of the Caribbean”. It feels strange and it is a sequence that is used to partially explain why Keanu Reeves is not Japanese. In that sequence Kai is battling what appears to be a demonic ogre and it is a CGI creation. A traditional fight would serve the story just as well but the 3-D needs to have some weapons fly off the screen and the leaps and jumps need to be made fitting for a jaded audience. I was still entertained but I would have been just as pleased with a straight drama. In the long run it was not great but it was good and I was entertained more than I expected to be. I hope that if you are interested you will take the time to see it in a theater. There are other films out there but if you are seeking mainstream entertainment and a entertaining action film, this is your best choice for the holiday period. Not my list but some good choices, take a couple of minutes to check them out.